The fun started on Friday. 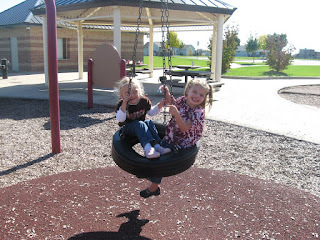 It was so nice outside that we headed to Helder Park with Lisa, Grace and Jacob for a picnic and playtime. Other than tons of bees trying to eat our lunch with us it was a great way to spend a couple hours. Friday night Jenna spent time with Grandma while Dave and I headed to dinner to celebrate his mom's upcoming 50th birthday! We all surprised her at Blue Water Grill, it was a great night! Oh yes, the fun is not over yet. Sunday after church we went to Cranes for lunch and some apple picking with Brad, Danee and Allee. 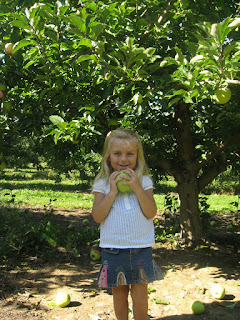 We didn't really need the apples but the lunch and experience for Jenna was very fun. The weather was a little warm and sort of took away from the fall feeling that normally comes with apple picking but it was fun nonetheless. 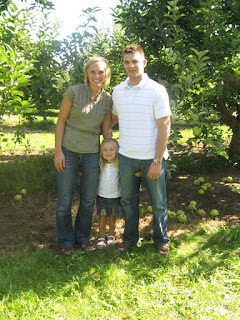 A family picture...why does taking a photo with a 3 year old have to be so hard?!? 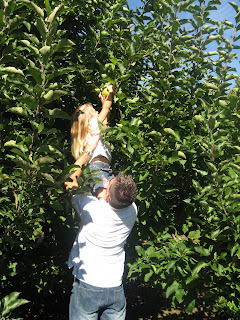 Jenna wasn't satisfied with the apples she could reach, she wanted the ones at the top! After a little time at home in the afternoon we headed to the Kapenga's for some pizza so Sandy could celebrate 50 with the grand kids...all 8 of them! It's a crazy bunch of kids with 5 of the 8 being boys under age 2 but so much fun. 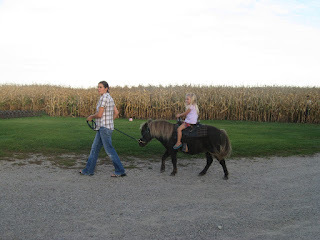 It was great to see them running around playing soccer and riding Joey the pony. Jenna LOVED her ride, thanks Amy! Today we ended this 4 day bonanza of fun by heading to grandma's to help with some yard work. It really wasn't much work, just trimming down her flowers and taking care of some outdoor decorations. Jenna was a big help and thanks to the "butterfly experience" she had at Parkers on Saturday night she loved looking for bugs. Today she found and touched caterpillars, roly poly bugs and watched a praying mantis on the tree. When I told her the little bug she had found was a roly poly she affectionately said "just like baby Allee"..... sorry Allee...rolls are cute at 5 months though!!! Hope everyone else had a great weekend too! Oh my goodness! I cannot believe she said that! OK I can but too funny! Thanks for the smile while I am at work. I will post pics from Sunday soon.